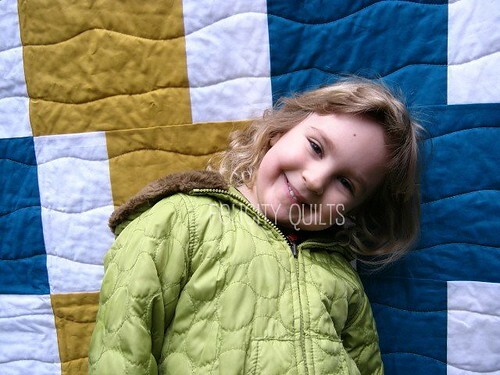 Today's feature is Felicity from Felicity Quilts. As she describes herself, a banker by day and quilter by night...I know a lot of us can identify with the same night hobby! 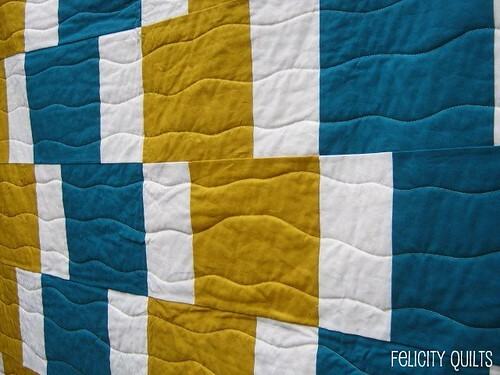 We've featured Felicity many times on Fabric Tuesday, she's got some great projects! Check out her finished quilts and her tutorials (including a very cool shoe wallet!). This modern finish really caught my eye, simple but really interesting. Great finish, thanks Felicity for sharing! Finally! I have finished my sample, so I can share my exciting project with you all! Introducing my first finish of 2012, Easy Going Modern. It's on the roster over at Patchwork Posse as a Workshop beginning February 2nd. Included in the $8 workshop cost is exclusive access to the pattern during the workshop, as well as support from me in the discussion forums, which are available only to workshop participants. 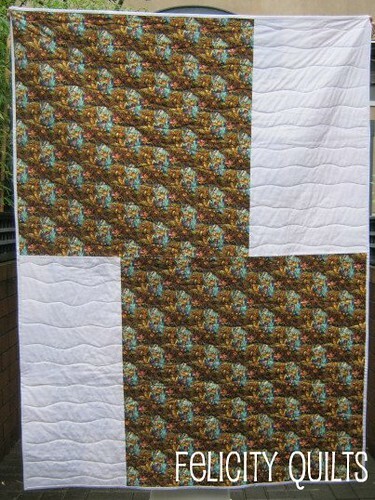 I'll be including a Layer Cake variation as well as a bonus project for using scraps to make a pillow cover. Easy Going Modern is a nice lap size quilt - 56" x 78" or so - perfect for snuggling on the couch. I quilted it with a really quick and easy wavy line that I did with my walking foot. Thread is Aurifil 50wt in a subtly variegated yellow. My daughter gives it a big smile, and I'm absolutely thrilled with it, too. I used Kona solids for the front: Carribbean, Curry and White. The back is Kona White and a print that is perfect for this quilt's recipients. It's bound in Kona White as well. Thanks for featuring me!! Just a note: the workshop is done. I'm working on a pattern for Easy Going Modern, so stay tuned to my blog! 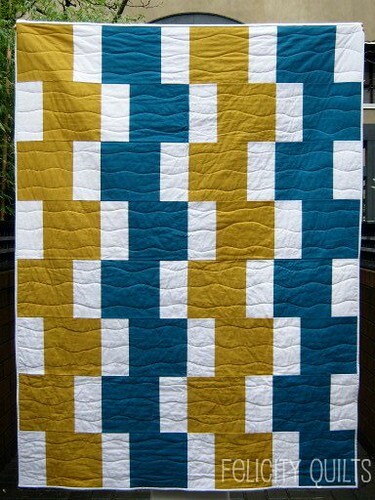 Such a pretty and simple quilt Felicity!